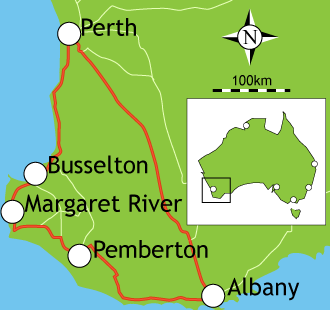 Beginning and ending in Perth, your five-day campervan adventure through the southern half of Western Australia takes you through Busselton, Margaret River, Pemberton, and Albany. Perth, with its Mediterranean climate and rich art and cultural opportunities is an excellent place to extend your trip. The beauty of Busselton's Geographic Bay, followed by the charming vineyards, and cheese and chocolate factories of Margaret River, will get your trip off to a great start. The second half of your trip takes you through the magical forests of Pemberton, surrounded by national parks, and on to the historic town of Albany. Bon Voyage! Before you leave on your trip, visit Western Tourist Radio (www.touristradio.com.au) for up-to-date information about traveling through Western Australia. The site has useful info, but also will tell you how to learn more as you are driving through the area. Start out early and drive 417 km north and west (about five hours) back to your starting point. Perth, on the Swan River between the Indian Ocean and the Darling Range, is the capital of Western Australia. Perth is famous for its cultural scene, with His Majesties Theatre, the Western Australian Art Gallery and the Perth Concert Hall. Beaches and sports, especially cricket, and the Mediterranean climate bring residents and visitors outside.